Important Hints: This kind of light is decorative light which designs for soft light. It is designed for creating a peaceful and tranquil atmosphere, so it is not as bright as ordinary light. 12 LEDs Spotlight gives you an incredible light display without costing you an extra cent for electricity. 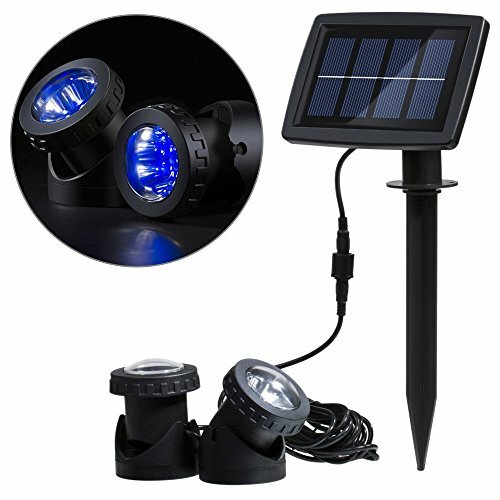 Solar 12 LEDs Spotlight equipped with solar panels that store energy from sunlight to power the LED lights after dark. This Waterproof and Weatherproof spotlight, Weatherproof, It can be used for lighting and decoration of path, Courtyards, Gardens, Pools. Tool-free Installation and adjustable lighting angle. Auto sensor,the light can automatically charge itself at day time(enough sunlight)and light up in dark environment. 1.Connect the control box and the stake. 2.Drive the stake into the ground and make sure that the solar panel is not sheltered from the sun. 3.Set the light on the places you want, like garden,pools,ponds, etc. 2.It is charging only when the button is turned ON. 4.Please put the solar panel under direct sunshine. If for any reason you are unhappy with any product by RivenAn, please do not hesitate to contact us. We always give top priority to customer satisfaction and will do our very best to solve your problem! 2 Submersible Lamps with two modes you can choose, there are have Steady mode and FLASH mode. No heat; no radiation; no UV or IR, environmental friendly, low consumption; high safety; high convenience. Dustproof, Waterproof grade IP68, it can be put in the water for a long time. Lights are adjustable (90 degree) in the base which is heavy enough to stay on the bottom of your pond with little movement. If you have any questions about this product by RivenAn, contact us by completing and submitting the form below. If you are looking for a specif part number, please include it with your message.